As the chairman of the ophthalmic devices section of the Standards Council of Canada and a founding member of the International Society for Contact Lens Research, Josephson knows whereof he speaks. Monovision is a method of correcting presbyopia by using a contact lens corrected for distance in one eye (usually the dominant one) and another lens corrected for near vision in the other eye. Monovision works for the patient because the brain’s visual cortex chooses the focused image and ignores the blurred image. So when the patient looks into the distance the dominant eye does the lion’s share of the work and when focused at near, the corrected, non-dominant eye is focused and does the job. According to Josephson, no active person with an add of 1.5 D or greater should be wearing monovision lenses unless they have compensatory eyeglasses for night driving. How Much Chair Time is Enough? Randy Kojima, director of technical affairs for Precision Technology Services, and instructor at Pacific University College of Optometry, notes that compared with ophthalmic glasses, multifocal contact lens designs are, “trying to pack all the power the patient needs into a tiny zone. For example, an average pupil for a 55-year-old presbyope in normal illumination is 3-3.5 mm, which means you need all the power packed into this small zone. It appears that early presbyopes do quite well in multifocal contact lenses but above +2.00 D one needs more magnification within a tinier zone and it becomes a bigger challenge to provide the extremes of far, near and intermediate vision. It’s like ophthalmic in that the bigger the add, the tougher it is to adapt. 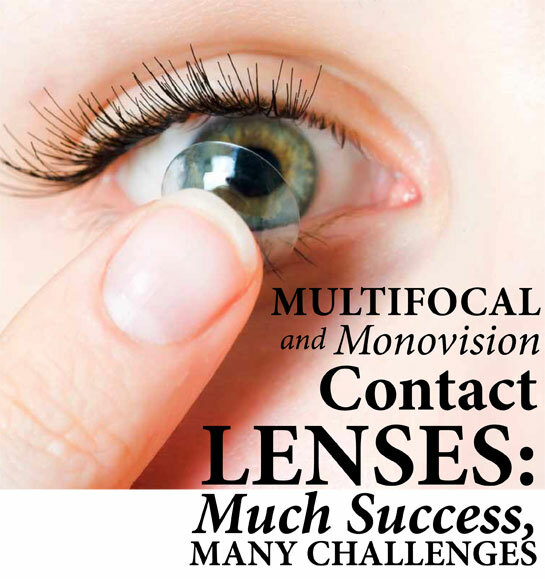 Having said that, multifocals are helping many patients with their presbyopia,” notes Kojima.